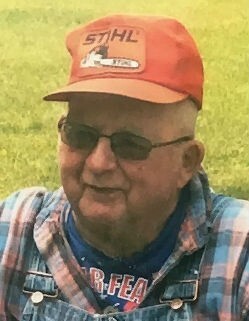 Edwin M. Bruce (Self Proclaimed Mayor of Arnold), age 80, of Arnold, passed away Thursday afternoon, December 6, 2018 at U.P Health System - Marquette surrounded by family. He was born the youngest of 14 children on November 23, 1938 in Escanaba, the son of John E. And Elvira (Olson) Bruce. Ed grew up and lived his life on the Bruce family homestead. He graduated from Gwinn High School with the Class of 1957. Following graduation, Ed worked in the woods until being drafted into the U.S. Army in 1961. Ed served during the Vietnam War until he was honorably discharged in 1963. After returning home, he worked for a few years on the Vanesse Pipe Line. Ed married the love of his life, Linda Lou Richards, aka “Little Lu Lu,” on August 27, 1966 at St. Joseph Catholic Church in Northland. Together the couple shared 52 years of marriage and raised 5 children. Ed began working in the Empire Mine as a dozer operator until retiring after 30 years of employment. Years ago, he also owned and operated Bruce’s Corner Store in Arnold. Ed’s dream after he retired was to build his own coffee shop so all of the locals could come over and “shoot the breeze.” This tradition carried on for the past 22 years. For several years, Ed and Linda hosted a County Road 557 community pig roast at their home. For many years, Ed and Linda enjoyed square dancing together. He also loved being out in the woods, especially four-wheeling, fishing, and hunting. Ed enjoyed having a sociable beer with family and friends, and always found humor in everything he did. For many years, he enjoyed playing Santa Claus at the Delta Plaza Mall in Escanaba. Ed loved being a greeter and bell ringer at St. Joseph Catholic Church in Northland where he was strong in his Catholic faith. Edwin M. Bruce is survived by wife, Linda Bruce of Arnold; 1 son, Russell (Josefina) Bruce of Queen Creek, AZ; 4 daughters, Mary Jo (Dave) Mahaffy of Wallace, MI, Pamela Bruce of Gwinn, MI, Peggy (Terrance) Julian of Porterfield, WI, and Tricia (Scott) Brisson of Green Bay, WI; 8 grandchildren; 2 great-grandchildren; sister, Carol Muther of Milwaukee, WI; and several nieces and nephews. In addition to his parents, Edwin was preceded in death by 6 brothers, Wallace Bruce, Clifford Bruce, Glenn Bruce, Eugene Bruce, Donald Bruce, and Russell Bruce; and 6 sisters, Gladys Sundquist, Lorraine Olson, Dorothy Anderson, Phyllis Christnagel, Marilyn Herm, and Evelyn Peterson. Visitation will be held from 9:30 a.m. to 11:00 a.m., Friday, December 14, 2018 at St. Joseph Catholic Church in Northland. Funeral services celebrating the life of Edwin will follow at 11:00 a.m., Friday, with Father Al Mott officiating. Burial will take place in Riverview Cemetery with the Escanaba River Post #115 conducting Military Honors. A luncheon will be served at the conclusion of the services at the Wells Township Hall in Arnold.